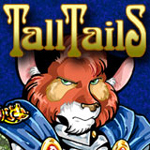 TALL TAILS: TEARS OF THE MOTHER NOW ON KICKSTARTER! TALL TAILS: TEARS OF THE MOTHER NOW ON KICKSTARTER! published on November 2, 2016 Read more posts by the author of TALL TAILS: TEARS OF THE MOTHER NOW ON KICKSTARTER!, Daphne LageNo Comments on TALL TAILS: TEARS OF THE MOTHER NOW ON KICKSTARTER! After a little more than 8 months on the new series, the first two issues are ready for their official debut!